School appeal letters for financial assistance are often addressed to the ministry of education, organizations working for children education and betterment, or it could be some politicians in government. It is required to outline your plans and indicate exactly how the requested financial aid will be beneficial for your organization and others. This letter conveys the purpose of your request and briefly indicates the anticipated result. State your purpose in a calm, professional, and factual manner. Write the letter of appeal in business style. Regarding the support and assistance I am writing this letter of appeal on behalf of our organization, Steffens Public High School, Number 7. The intention of this is to inform you about our requirements and plead. I am in no doubt that you must be aware that the condition of our school is very hazardous, the walls and roofs of nearly all of the classrooms have became dangerous for students and teachers. There are cracks visible on almost all the walls and roofs of many classrooms are badly leaking. We are not able to follow our schedule since the classrooms are not safe for the students in this rainy season. Students are beaten by the rain and cold. Further, the laboratories of our school do not have basic apparatus. Due to all of these difficulties we appeal your further financial support. Your positive response is anticipated. Thank you for your help and support. Given Below are a few Appeal letter samples for a clearer Idea. The purpose of writing a reconsideration letter is to request someone to think once again on their decision. Sample Unemployment appeal letters are generally addressed to potential employers/ recruiters/ organizations in case of any job openings. Property Tax Appeal letter is usually addressed to the concerned tax department with the intention of refund of excess amount. 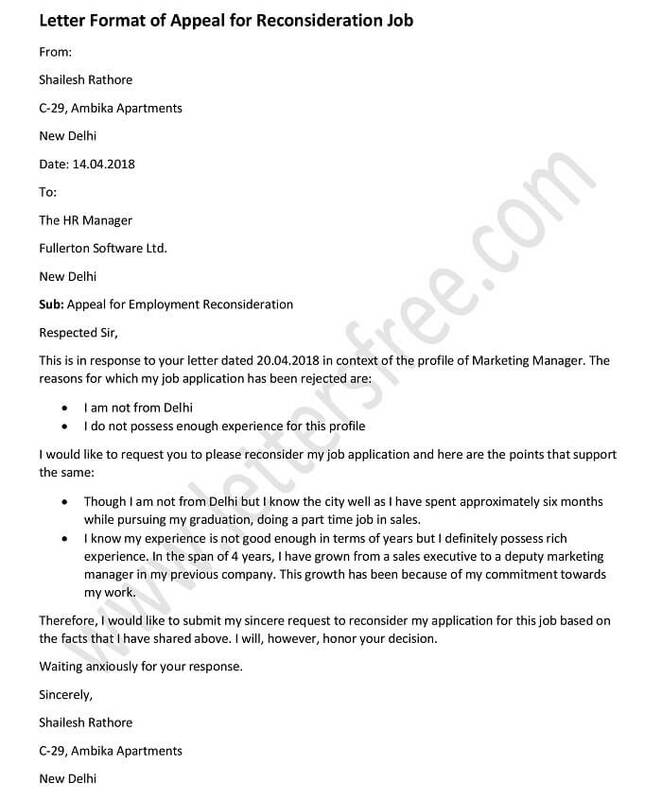 Example of Personal appeal letter is sometimes the most effective way to convey your message regarding certain request. Tickets issued for parking violations are not easy to appeal against but if you have been issued a parking ticket without your fault and you want to plea against it. Fund raising appeal letters are usually addressed to those who are able and willing to provide support in the form of monetary help.